and this is my first official guest blog post. 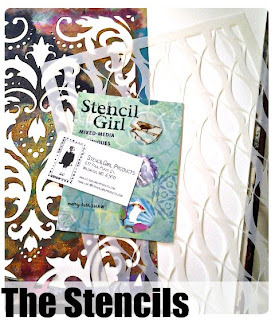 And what a treat to do this for StencilGirl Products! 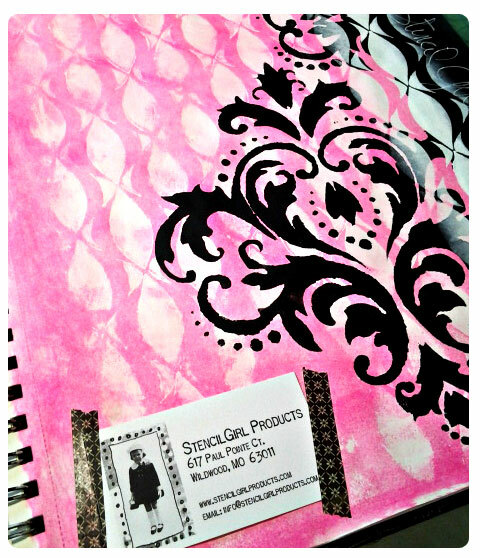 I already have the Damask stencil from Michelle Ward and knew I wanted to use it in conjunction with something new. As soon as I saw the Strands stencil from Mary Beth Shaw I thought it was a perfect fit for what I had in mind. 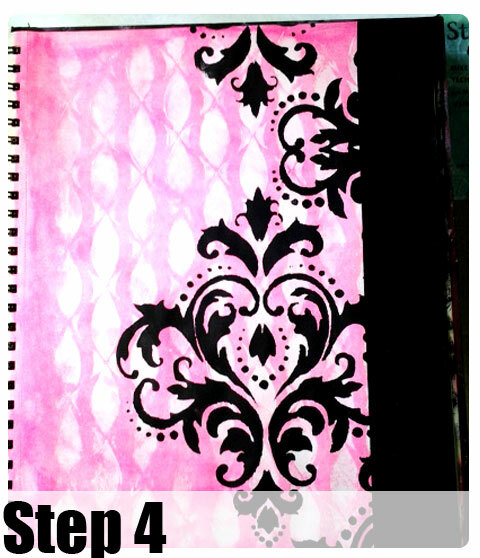 I wanted to carry over a technique from my altered book days I like to call ‘graduated stencils’ and I hope it sparks some of you to think of new and creative ways to use your stencils in your art. Sit back and watch as I create this project for you. The video is a mini class for you! Then I have step-outs of each step below. They are not from the same collection or even from the same artist. Yet they look amazing together. I think being able to mix and match stencils in this way gives them so much more versatility. I choose to use some basic items that I think most of us have in our studios. 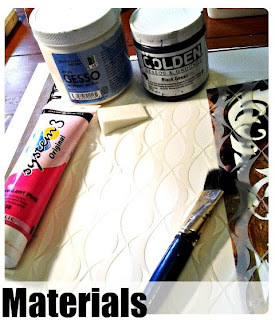 White gesso and black gesso [you can substitute any white and black paint also], a single color of my favorite paint, a cosmetic wedge sponge and a paint brush. I also used: water, palette knife, masking tape and a bit of washi tape. For our first layer place one of the stencils down onto non-prepped paper [will not work as well on pre-treated or gesso’d pages]. With this particular stencil it was super easy to move it around and create an all over pattern. All this to fully dry [you can speed up drying time with your heat gun]. 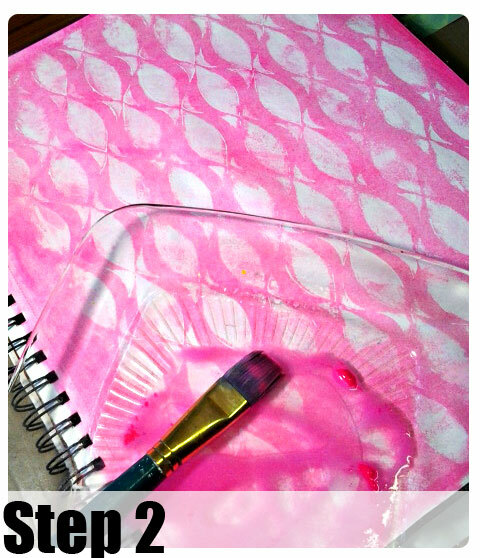 Mix up a wash of color with your one paint color and water. Brush liberally over the now dry page. Then using a baby wipe or a damp rag wipe the excess paint off of the gesso pattern created from the stencil. Gesso will resist the paint wash just enough to give you a nice patterned background. If your color is too light you can repeat this step until you are satisfied with your color. 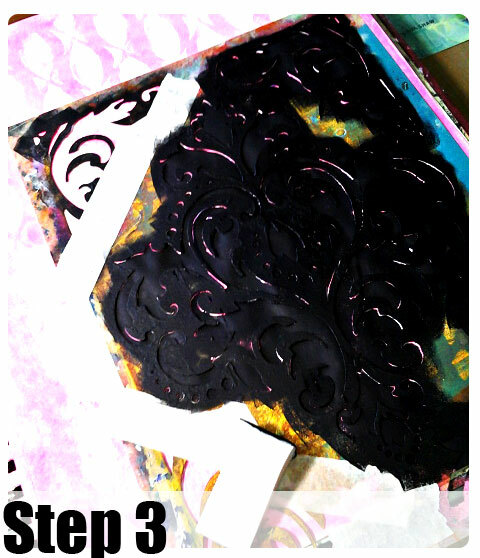 Using masking tape I taped off certain areas of the second stencil then using the cosmetic wedge applied black gesso to the surface for a second layer. 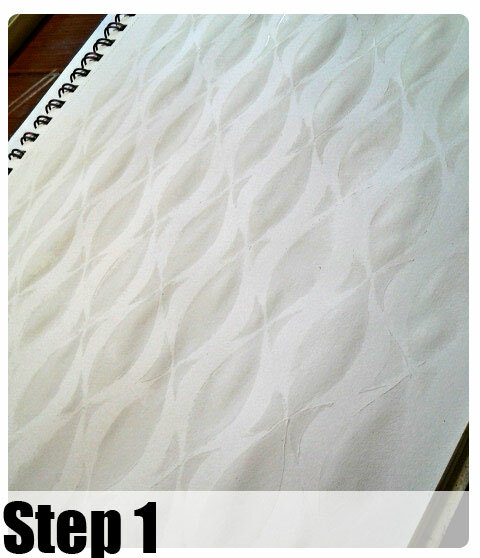 Once that was dry I flipped the stencil over and positioned it to repeat the pattern top to bottom on 2/3 rds of the page. I then used scrap paper to mask off the right edge of the page and sponged on more of the black gesso. Here comes the gradient portion. Again using the first stencil [original background design] I taped it down slightly and using the cosmetic wedge applied white gesso just over the edge of the black border and the rest of the page. By doing this I broke up the solid black line and in a way ‘masked it’ from view. I was careful to line up the stencil with the original background layer so that it creates a bit of an optical illusion. I start directly in the center, over top of the hard black line. And my using only part of the sponge and working towards the center [or towards the black line] I was able to get a soft gradient like appearance. The white appears to fade off into the black. Or maybe the black is fading into the white? This is so much fun to do. 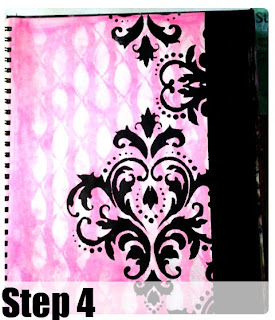 And you can also do this with a second color that contrasts nicely with your first color. In this case I could have used aqua or teal instead of the white to get a big pop of visual interest. 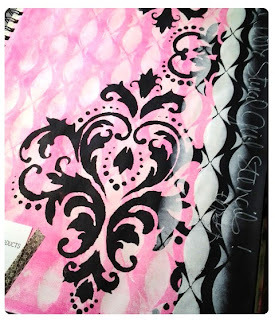 For the finishing touches I did a small bit of journaling with a white gel pen just over the black border. 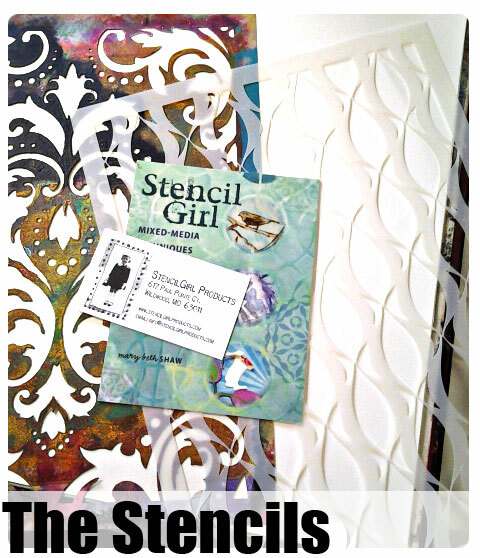 And I used a bit of washi tape to add the StencilGirl business card to my page. Now I will always remember this fun opportunity whenever I see my journal page. 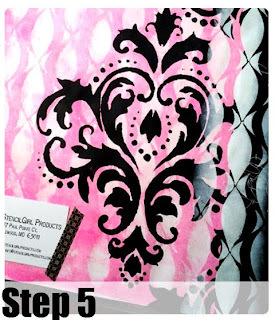 I hope you have enjoyed this quick tutorial and maybe have a few new ideas for fun ways to use your Stencil Girl stencils! This is a great project Christy! I love seeing how you go about it. There is always something to learn. Your colors are beautiful. I don't know why I stay away from fluorescent pink! You handle it beautifully! oooooooooh I really love this and that damask... is fantastic. I love the illusion you created with them all. Great video tutorial and great journal page. Love how you finished it with the gradients.